Last night: we got to go to Christopher's baseball game in Orient Ohio. It was excellent weather for me, but Peggy ended up with a blanket around her. The image on the left shows Christopher getting a hit even though it was a foul ball. This was Christopher's first year playing baseball and is doing well. One particular play, I think he was a bit confused as to where to throw. It was a hit right down first base and got past the first baseman where Christopher got the ball. It was too late to throw to first so, Christopher should have cut the boy off at second. The boy heading at first base but could have run to second but fortunately hesitated and stayed on first. So, Chris should have automatically thrown to second to cut him off but instead, throw to first. That play was a result of Inexperience and next time he will know what to do. At one point, Christopher was on first and his dad, Chris was the first base coach. Chris told Christopher to steal second. This time Christopher hesitated and they throw him out. Christopher's team will not be getting first place awards this year but will gain a ton of experience. Every person on the team will play the whole game because they only have eight (8) kids on the team. As a matter of fact, if one of the boys happens to be on vacation during a specific game, the team will be allowed to play but will get an automatic out each inning. If two kids are out, the team will have to forfeit the game. Again, this was nothing more than inexperience and the first time he tried to steal a base. All that said, I am really impressed how quickly he is coming along for his first year. 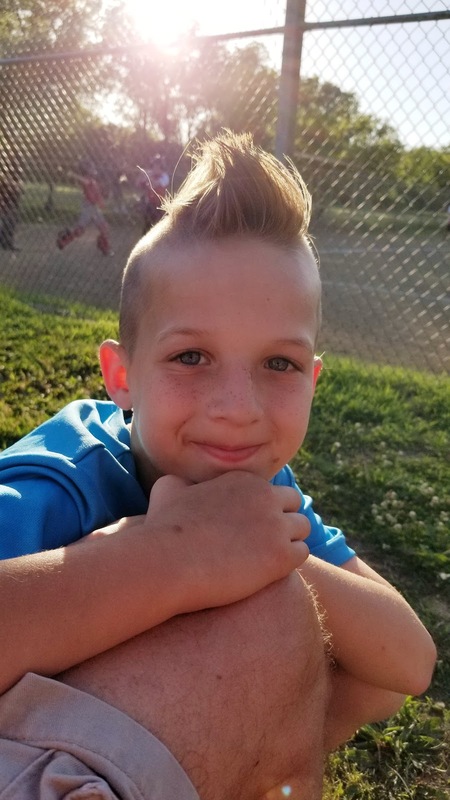 In other news, the boys just got out of school for summary break and the first thing Cameron wanted was a Mohawk. Now. the school they attend do not allow this hairstyle, so the moment Cameron started summer break, he went to the barber and got a haircut. I thought it was awesome even though, Crystal may have used the word "goober". Well, all I know is he really liked getting it but in reality, he will not take care of it with the necessary products to keep it standing up. That is okay, he likes it, I like it, and dog-gone-it, he is adorable.